The Perfect Introduction to Electronic Bible Study!The Essential Bible Study Library includes the Libronix software--the world's best Bible study soft ware--and a powerful collection of the electronic versions of trusted Thomas Nelson Bibles, Bible reference works, and devotionals. You will be able to study the Bible like never before. Search for any word or topic in any of your Bibles or books. Create word studies with just one click. 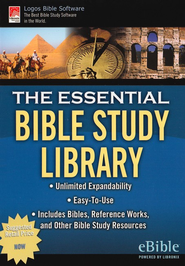 You'll be amazed at how easy and powerful it is to study the Bible with The Essential Bible Study Library. BIBLES: The King James Version, The New Century Version, The New King James Version.